Library and House of Manuscripts of the al-Abbas's (p) Holy Shrine discusses ways to strengthen cooperation with UNESCO. 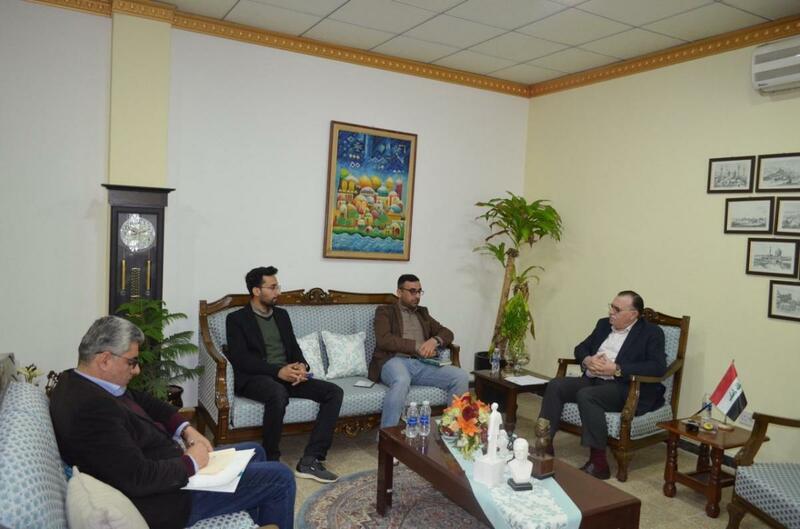 A delegation representing the Library and House of Manuscripts of the al-Abbas's (p) Holy Shrine discussed with the Iraqi Ministry of Culture and Tourism, means of strengthening and developing the relationship with UNESCO regarding the field of maintenance and restoration of manuscripts and documents in particular and heritage in general. This mentioned delegation visited the Ministry's headquarters and met with the Director General of the Department of Public Cultural Relations at the Ministry of Culture, Tourism and Antiquities; Mr. Falah Hassan Shaker Al-Ani, who expressed his great pleasure for receiving them, expressing at the same time the readiness of the ministry to work together with the library and the House of Manuscripts of the al-Abbas's (p) Holy Shrine for the benefit to Iraq, and the definition of its great heritage and conveying this message to the UNESCO, stressing also that the ministry is supportive of such aspirations. Speaking about the visit, Professor Laith Ali, Director of the Center for the Restoration and Maintenance of Manuscripts, said: "During this visit we discussed the possibility of coordination between the Manuscript Restoration Center and UNESCO in the field of maintenance and restoration of manuscripts and documents in particular. We have also given a brief explanation about the nature of work conducted by the Center, and the processes and procedures that are carried out on the manuscript in the Center. And Professor Ammar Hussein from the electronic library, gave a definition of the work of other centers of the Library and House of manuscripts at the al-Abbas's (p) holy shrine, and the possibility of benefiting from the services provided by the library for the purpose of joining UNESCO, and so that the library is considered as an accredited body of UNESCO."